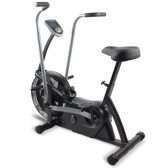 There are a variety of different types of exercise bikes available. 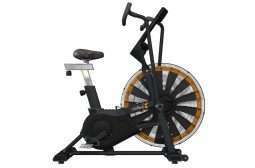 You can choose between recumbent bikes, upright bikes, spin bikes, and…air bikes? But, what’s so special about air bikes? First, any bike-based exercise is a great altertive for those who are unable to do other forms of cardio like running on a treadmill or using an elliptical. For example, if you have a rolled ankle or a quad or hip flexor strain, an air bike provides a good option for exercising safely. It’s a great tool for rehabilitation as it provides safe movement with no impact. It also allows the area of the injury to move and provide blood flow to the area to aid in recovery. As far as conditioning, air bikes are the perfect tool for interval training like HIIT (High Intensity Interval Training). 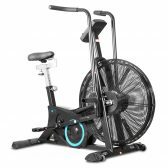 Unlike other types of exercise bikes with fixed handles, an air bike has handles that move with your peddaling action, so you get a full upper body workout as you work your legs. 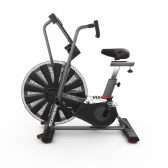 Other exercise bikes may use a the weight of a flywheel combined with a resistance brake to add resistance to your workout. 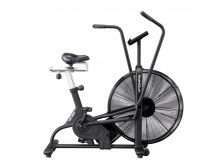 Air bikes use wind resistance via a large fan – so the harder you work, the more resistance you feel. It’s very linear and simple to use! You also get the cooling effect from the air moving through the fan – helping you to keep cool during your workout. Low-impact, total-body workout – Air bikes get your arms in the action for better conditioning and calorie burning, all without any jarring impact to the joints. 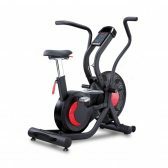 Infinite intensity and resistance – Unlike other types of exercise bikes, air bikes provide the advantage of unlimited wind resistance to customize every stage of your workout.